Fiction – Kindle edition; Vintage Digital; 240 pages; 2014. Review copy courtesy of the publisher. 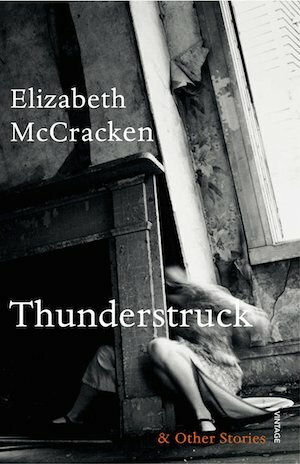 Elizabeth McCracken’s Thunderstruck & Other Stories was long listed for this year’s Folio Prize, which is how I came to read it. Say what you want about prizes, or the sheer proliferation of them, but they do bring books to my attention that might otherwise pass me by. There are nine stories in this collection and while it’s hard to pinpoint a unifying thread between them all, I’d say it’s probably loss: these are largely tales about people who suffer some kind of trauma — there’s quite a lot of death and grief here — or go missing. I read the book on my tube journey into work — one story a day — and thought it was a fairly uneven collection. Ask me to summarise each of the nine and I’d be hard pressed to do so: but three definitely stand out. In Property, a 39-year-old scholar, Stony Badower, accepts a two-year job in Maine cataloguing a collection of 1960s underground publications. It was supposed to be a happy return to America after having lived abroad with his German wife, Pamela, for three years. But shortly before the couple are due to move in to the rental house, Pam dies. Stony proceeds as planned — only to find the house isn’t quite the charming studio the ad on the website made it out to be. The landlords had filled the house with all their belongings and said, ‘This will be fine for other people’. But when Stony complains about the state of the place and later cleans it up himself, throwing away broken furniture and old condiments left in the kitchen, he unwittingly upsets the (somewhat kooky) landlady, who feels violated by the changes he’s made. In The House of Two Three-Legged Dogs, an expat living in France, has a soft spot for unwanted animals. The 11-bedroom house he and his wife share is overrun with all kinds of pets, including an entire room devoted to budgerigars — but their relatively peaceful, if impoverished existence, is shattered when a man gives them an African grey parrot and demands 50 euro for it. But that seems to be the least of their concerns: their alcoholic son is planning to sell the house out from under them. The day of Helen’s accident — or perhaps the day before; they would never know exactly when the accident happened — she was as lovely and as childish as ever. In the make-up section of the Monoprix, she lipsticked a mouth on the edge of her hand, the lower lip on her thumb and the upper on her index finger. “Bonjour,” she said to her mother, through the hand. In all of these stories, McCracken’s emphasis is on observation and character, rather than plot. She’s very good at capturing what makes humans tick and of revealing the ways in which people deal with loss, bereavement, loneliness, disappointment and despair. But her prose is so dry and distant, I struggled to emotionally connect with many of the tales, save for the title story, which is beautiful and brave in its depiction of a mother and father realising that happiness is fragile and fleeting. Overall, Thunderstruck & Other Stories is a bit of a mixed bag. In these occasionally alarming, often maudlin and always haunting stories — many of which have been published elsewhere, such as Granta and Zoetrope: All Story — ordinary people are forced to deal with extraordinary circumstances, but the outcomes are far from predictable. Well, I’m not a short story expert, so maybe I missed something those folk who wax lyrical did not. But I know what I like, and it’s fair to say this one entertained me, but didn’t WOW me. Likewise I have heard fanatical enthusiasm for this collection. I find myself reading more short stories but collections seem to work best for me when there are linked themes or motifs, otherwise I prefer the stand alone story through journals or other sources. Well, as I said in response to Poppypeacockpens, I’m no short story expert, and I’m not quite sure what makes a good one from a bad one. I just know that I rather liked this collection but I didn’t love it. I read this one last year and enjoyed it but seven or eight months on I struggle to bring to mind any of the stories without flicking back through the book, and even then it’s the vaguest of recollection. Which is the thing with reading a lot of short stories – I read sixty collections last year so let’s say about 600 individual stories, most taking between 20 and 40 minutes to read. So they have to be really good to leave a lasting impression, and McCracken’s were just run-of-the-mill good – they do everything a short story has to do and do it well, but I wasn’t surprised by any of them, wasn’t left mulling them over, wasn’t wowed by their inventiveness. So many stories – especially American stories where the form seems to enjoy much more respect and recognition – are written to a very high standard, that it takes something very special to stand out and McCracken’s for me have blended into that mass of decent – but ultimately forgettable – stories that I read. This collection, as well as being longlisted for the Folio was longlisted for the National Book Award and, just a few weeks ago, won The Story Prize where it was up against Lorrie Moore’s ‘Bark’ (which I found tedious in its trying-too-hard attempt to be funny) and Francesca Marciano’s ‘The Other Language’, a collection which really HAS left an impact – I can easily bring to mind characters, images, and plots from half the stories in that book, likewise those in last years National Book Award Winner, ‘Redeployment’ by Phil Klay. Those are the ones I’ll still be thinking about in another year’s time, and the ones I’ll want to read again. I’m impressed you read so many collections, David. It’s an art form that I’m growing to like more and more as I get older, but I find the quality so variable that I’m never quite sure if I’m simply choosing the wrong books or whether it’s nigh on impossible to produce a collection that doesn’t have one dud or filler in it.